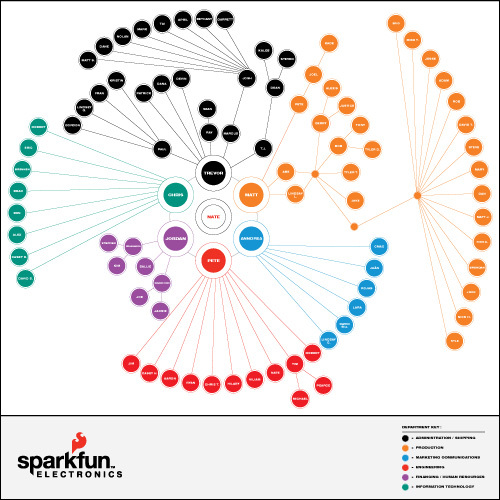 As SparkFun has grown, we've had to hire dozens of new people - from shipping and production, to marketing and engineering - every department has gotten larger. Right now, we are sitting at nearly 100 people strong. Crazy! In the past 7 years (7? Really?!) we have gone from one room in a house to an entire office building in North Boulder. It's exciting, stressful, and pretty darn cool. Recently, MarComm (that's marketing-communications) created the above poster for our breakroom to help us keep everyone straight. We thought we'd share. You can see Nate in the center and everyone radiates out from there. It's crazy how far we've come, yet things around here still feel the same (with the exception that the keg seems to run out faster than ever). Hearty and resounding thanks go out to all of you for contributing to our success! Cheers! Your packing group needs to step it up. It's taken you guys three (3) tries to get me the right AVRs at work (kept getting PICs) and two tries to get the right chips for home use; all in the past two weeks! SFE, don't get me wrong, you guys always step up when it comes time to fix the mistakes, it's just frustrating when your project at work is delayed 2 weeks because of the slip-ups in the first place. But I'm not. Congratulations! You guys are proof positive that a good business model, great staff, and amazing customer service will eventually lead to success... in your case "eventually" turned out to be a lot quicker than most. Hehe, someone messed up Ryan's line, I saw that! Its really a great showcase of how one can build a solid business with this kind of growth ! Does Tim in engineering have a special project, or are they his 2 apprectice(Michael/Pearce)? I'm the Technical Support manager. Shouldn't the org chart be in 3D? Or animated! Any chance of an updated chart to show how far you've come since then? On a side note, I think you forgot some key players: the office dogs! First off, awesome organization chart! Second off, could you ask MarComm what chart program they used to make it? Unless it's just Photoshop or Illustrator but I really hope not. And third off, I wish you guys were in need of programmers, or that you were a game company. Heck, I just wish I find a game company that is as awesome and is as much fun to work for as you guys. It is, in fact, Adobe Illustrator. Poster? Shouldn't this be a FLEX app broadcast on an LCD? 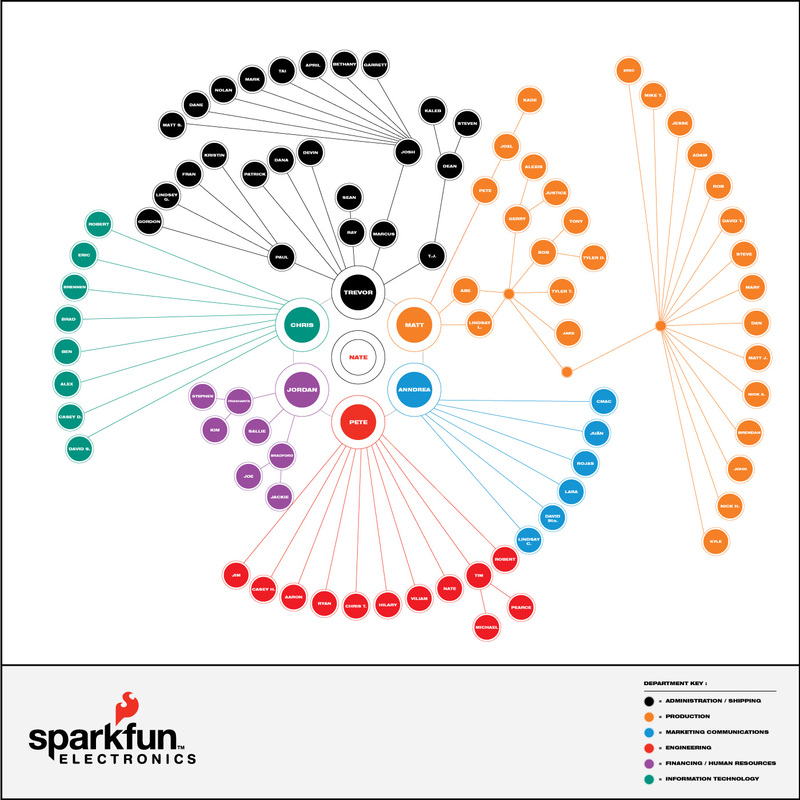 How did Sparkfun grow so big so quickly? I don't really know if I like what this guy is doing. I feel like it is jeopardizing certain rights and resources us hobbyists enjoy. No point having a right if you're too timid to exercise it. What you can't see is some people are probably in pajamas, some people have slippers, and some people are barefoot. Yeah, the Nate under engineering should be Nate B. And there are two Roberts, but we both have a last name starting with 'C'. Wow - thanks all! We're just doing what we love to do. It's been a wild ride and we always like to share some of the inner workings of what's going on. Where's the Quality group?... rework team? service? guess you must do things right the first time. No specific departments are listed. Quality control and rework is under production. Customer service is under administration and tech support is under engineering. :-) It's all there, just not labeled specifically. Wow! Amazing company! Awesome work guys/gals! BTW: I LOVE the org chart! You guys rule in every detail!